LLD is how I would describe her, but her real name is Pam. 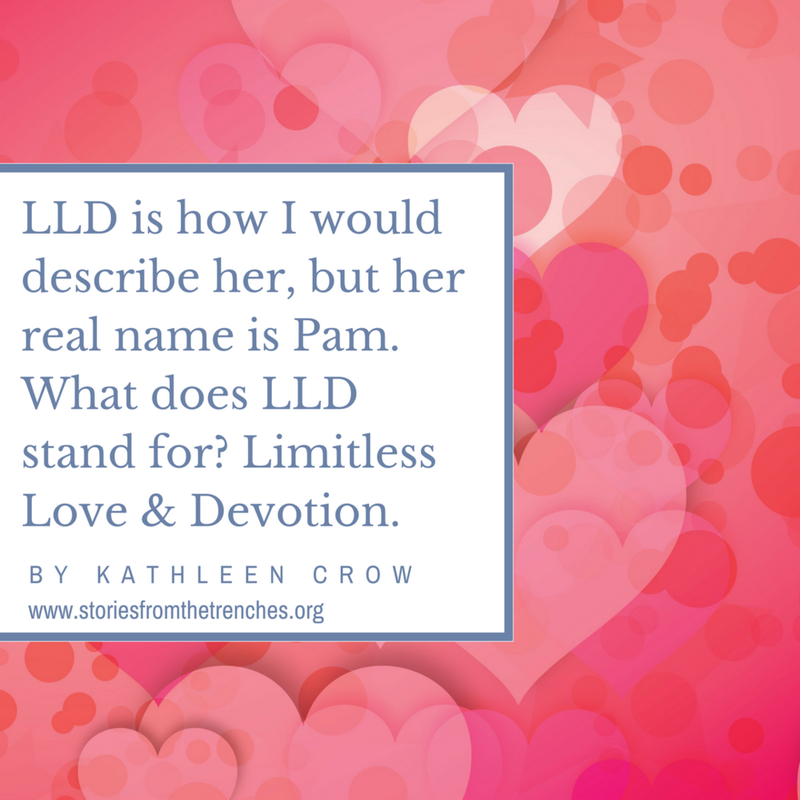 What does LLD stand for? Limitless Love & Devotion. Despite having eight, (yes, I said eight children!!) to love on and care for, Pam was there for me. She totally supported me at one of my lowest points in my life. Here’s my story. 1996 was a bittersweet year for me. I had just landed a dream job as a nanny with a wonderful family, I also found out that I was pregnant. My husband and I were NOT trying to have a baby. We were still in our "newlywed" mindset, even though we were just about to celebrate our 5th wedding anniversary. My job and pregnancy were going along well, until October of that year when everything began to unravel. My little guy (Nathanial) was arriving way too early, and my life changed forever. I wasn't able to hold him close upon his birth due to the emergency surgery I had to have. I awakened knowing that our son was gone. I was grateful that I was able to hold him off and on during those first thirty-six hours, thanks to the warming blankets the hospital kindly provided, yet I could feel his cold, lifeless body. After struggling through the pain of losing our son and learning to survive in "my new normal" without him, we decided in 1998 that we were ready, (for real this time), for another baby. It was almost instant, it seemed. I knew I was pregnant within two weeks. I took the pregnancy test, and when I saw that extremely faint line, I was thrilled. Yep, I took four tests, probably every three days, and the positive line became more and more clear. I had determined that I was going to do whatever it took to make sure I had a healthy pregnancy and healthy baby. We took all the possible tests, and met with top specialists. I stopped working full time, had more bed rest, and skipped anything that could or would cause stress, etc. I was reluctant at first to tell anyone the news, because I was afraid. It wasn't until after my first trimester that we shared the news. Everyone was ecstatic!! We were nervous, but excited, too. And my friend Pam was there with me all along the way. Pam and I met at a church in the Chicago area around 1992. She was one of the friendliest people that I had encountered. She's very beautiful outwardly, and even more so inwardly. Her smiles and laughter say so much. Even though Pam has experienced her own struggles in life, she's never allowed hardship to stop her from giving to everyone in some manner. There were times when we would not see eye-to-eye (small phrase for "almost argue"), about her not having limits. Little did I know that very fountain of "abundant-giving love" was going to be dipped into by no one other than myself. June 1998. It was happening again. My water broke, and I could not calm myself down. “This cannot…just cannot be happening again,” I said out loud to myself. I immediately grabbed my cordless phone, laid on my sofa with my feet elevated up on pillows, and called my doctor’s office. I called my husband. I called my friend to pick me up, because my husband couldn't get to me fast enough. I headed to the hospital, where I screamed at the nurse to let me lie down. I was then taken into triage, where I was so RELIEVED to hear my baby's heartbeat. I was in the hospital for two days with my baby having a strong heartbeat and no infection setting in. The "specialist" told me that it was rare for an amniotic sac to repair itself, but that it was possible. I was released from the hospital with enormous restrictions. I could only get out of bed for 5 minutes per day! I had no biological family nearby, but Pam was there for me emotionally, physically, mentally, and spiritually. She came to assist me and my husband without hesitation. She gave above and beyond! From what I could recall, Pam came to my home for five full days. Not only did she go to the grocery store, cook, clean, and run errands for my husband, she was there for me emotionally. She stood by me in those days and nights to help relieve so much of the pressure and fears. She encouraged me to stay positive and to find joy no matter what. She hosted friends that came to visit. She protected me. Pam made my life so much easier. She seemed to bond with me in a way that was different than any other friend I had. She was not only connecting with me, but with my little one within my womb. I was calm. Pam helped my life to be so much calmer in the midst of my storm. July 25th. The bed rest worked for a little while, but not long enough. She was here for only three hours, but she was here. With me, her mommy. With her daddy. I didn't want to hold her at first, because I wasn't sure if I could survive without her. The fear was massive. She was just so tiny. Her name tag fit around her waist. But I found strength to hold her. The courage and strength came because of the great love I saw in her father’s face, and I had received seeds of joy and strength from my friend Pam. Had I not had Pam in my life during those critical five days, I am not sure I could have seen my little angel’s face or held her while she was alive. A true gift indeed. Pam felt the loss with me like no other friend. She somehow carried our Victoria Grace in her heart. For the first few years after losing her, Pam struggled with missing her, too. And to this day, Pam remembers. She knows. She loves. I am grateful for all that she has given to me. She's a very rare gem. I love you, Pamela Wilson, and I say thank you again for being a true, loving, giving, faithful friend.